Amenities: Gaslamp CitySquare condos offer a 12,000 sq.ft. courtyard with pool, hot tub and BBQs and gym. On site managers office on 4th floor and a nighttime security guard from 9pm to 5am. Other: Only the interior courtyard level units have patios, no other units have patios or balconies. If you like the Gaslamp City Square condos, you may also want to check out the Trellis condos also in the Gaslamp district. 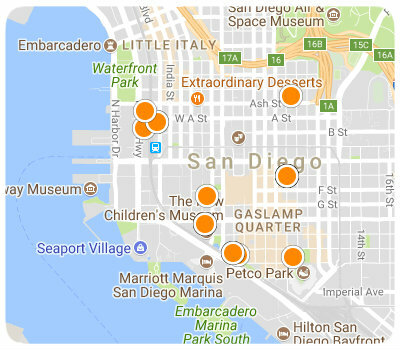 Join the residents of Gaslamp CitySquare and experience the excitement of living downtown. Like the most: The residents here at the Gaslamp CitySquare condos have conveyed to me WOW factor prevails on this buildings location, right in the heart of the historic Gaslamp district. Residents raved about the location and how convenient and quick it is to walk to everything. Residents were also complimentary of the very large inner courtyard with a lot of common patio space, barbecues, a pool and hot tub. Residents also like the low HOA fees, especially when considering the building has a pool. Great stores and restaurants in the ground floor retail spaces. Units get a lot of natural light with the large windows. The common hallways are very wide. Like the least: Because this was the developers? (Champion Development) first attempt at a residential project they made some mistakes with regard to the design of the buildings exterior and lobby. For the buildings exterior facade they paid dearly, almost a million dollars to put the right look on the outside, with pressure from the City. One resident described the lobby as looking like a "sterile Soviet era hotel". They also did not understand they types and amount of equipment needed to adequately supply a residential fitness center. One resident said she did not like the parking situation which is not as secure as most private garages. Here there are 3 levels of parking, the first level is public (think guests) parking operated by ACE and cost from $5 - $30/day. The lower two levels are for residents. Other comments: Only the residents on the courtyard level (level 3) facing the courtyard have patios. No other units have patios or balconies. If you look at other mid-rise condo buildings and notice they have balconies its because they used the interior space to make them. So its really a matter of preference to have the space for interior use or as a balcony. No low-rise building has balconies that extend out from the building. Most ground floor retail spaces are leased by very upscale restaurants or clothing boutiques. Across the street are several upscale restaurants at the Pendry hotel. This is a prime example of location, location, location!